Bangladesh, officially the People's Republic of Bangladesh (গণপ্রজাতন্ত্রী বাংলাদেশ), is a country in South Asia and becoming one of the famous tourist destination of the world. It is the home of the largest mangrove forest; i.e. Sundarbans and the longest unbroken sandy sea beach; i.e. Cox’s Bazar and formed on the Largest Delta on Earth. Bangladesh shares its borders with India and Myanmar (former Burma). The country's maritime territory in the Bay of Bengal is roughly equal to the size of its land area. Bangladesh is the world's eighth most populous country. Dhaka is the capital and the largest city, followed by Chittagong, which has the country's largest port. Other large cities are Sylhet, Rajshahi, Khulna, Barisal etc. Bangladesh include people of different ethnic groups and religions. 98% of people of Bangladesh are Bengalis, who speak the official Bengali language. Southwestern part of Bangladesh is the Bengal delta. The country has 700 rivers and roughly 8,000 km (5,000 miles) of inland waterways. Bangladesh is known to outer world for mainly flood and disasters. But tourists from around the world known Bangladesh for Sundarbans, Cox’s Bazar, Paharpur Mahavihara, The Mosque city Bagerhat etc. Other famous tourist destinations are Chittagong, Bandarban, Khagrachari, Rangamati, Sylhet, Khulna, Rajshahi etc. The natural places of Bangladesh include highlands with evergreen forests, number of islands, sea beaches, etc. And the country is also rich with ancient manmade structures as ruins of Buddhist monastery, Forts, Palaces, Ruins of Ancient Civilizations, etc. The country's biodiversity includes a vast array of plant and wildlife, including critically endangered Bengal tigers, the national animal. Bordered on three sides by India and sharing a border with Myanmar (Burma), Bangladesh is located in south Asia on the northern edge of the Bay of Bengal. Approximately 120 million people inhabit an area the size of Wisconsin. Bangladesh consists primarily of low-lying plains that never rise more than 35 feet above sea level. The delta region of 55,598 square miles is formed by the Ganges and Brahmaputra Rivers and smaller tributary rivers. 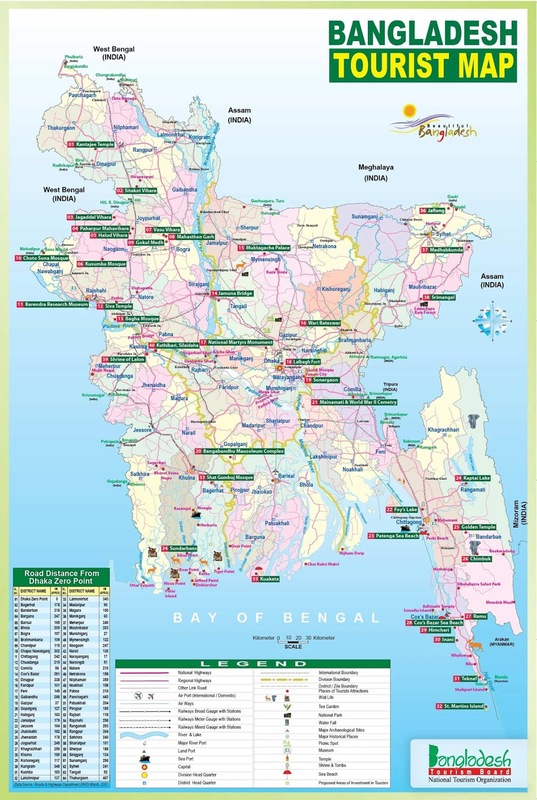 Changes in topography occur only in the northeastern hilly tea-growing regions of Sylhet and the southeastern forest regions of the Chittagong Hill Tracts. The capital, Dhaka, is less than 25 feet above sea level. Bangladesh has three main seasons. The mild (70°F) season, from mid-October to the end of February, is characterized by clear sunny skies and cool (50°F) evenings. This is when cyclones are least likely, making travel in the Chittagong Hill Tracts and Cox's Bazar ideal. The hot season, from March until the end of May, has little rain. The early part is pleasant (75°F), but as the monsoon approaches, hot (95°F) temperatures and high humidity make life extremely difficult. The monsoon season is June to mid-October. At the beginning of the monsoon, the continuous rains cool the atmosphere. Temperatures are milder (85 to 90°F), but it is the oppressive humidity that makes the climate uncomfortable. Tropical cyclones that emerge from the Bay of Bengal with high winds and tidal waves hit Bangladesh an average of 16 times a decade. Travelers must be prepared for flooding and cyclones, particularly in the coastal areas, throughout the monsoon season. Unpredictable weather patterns during the monsoon season greatly affect living conditions and agricultural crops throughout the country. World War - II Cemetery, Mainamati, Comilla. © 2019 The Bangladesh Network.